I reckon I can pinpoint the shift in my perception back to this day one year ago, when we took a walk through a patch of rainforest in the Florentine Valley, northwest of Hobart. I'd seen rainforest before, and as someone with botanical leanings. Sure, I saw rainforest to be lush and peaceful but a little dull and simplistic, botanically speaking. You see, I was the kind of guy whose juices tended to flow at the sight of species-rich, dry sandy heathland or grassland, with their grand display of wild flowers in Spring. These Mycena viscidocruenta were spotted on that pivotal bush walk exactly one year ago. 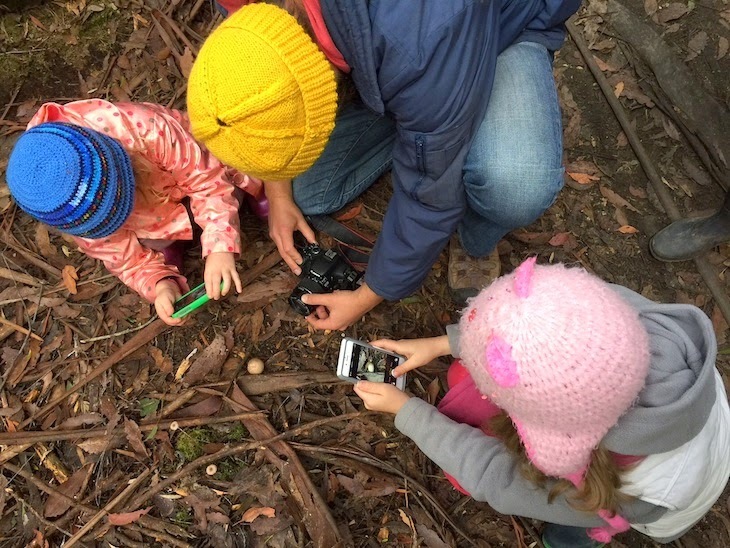 Since that eye-opening bushwalk exactly one year ago, we have been on about sixty dedicated fungi walks. The owlets have accompanied me on all but a few of these, and as a result they have developed keen fungi-spotting goggles and even learned the names of many! It's pretty awesome. 1. Perception of the natural world is limited by ones attitudes to it and time spent in it. On my walks sometimes strangers would see me crouched awkwardly with my camera and ask me what I was looking at. When I explained or showed people the fungi, often the response would be along the lines of "Oh I walk along here all the time, I've never noticed them!" I think there are many things I see, but treat as background noise to perception. It takes focus to see past that which we see easily. This can translate into our modern society, for example, it's is quite easy to ignore the under-privileged, the down-trodden and the minorities, unless we intentionally open our hearts and focus attention. Empathy can really open the minds-eye. 2. There really are worlds within world's but most humans will see only one. 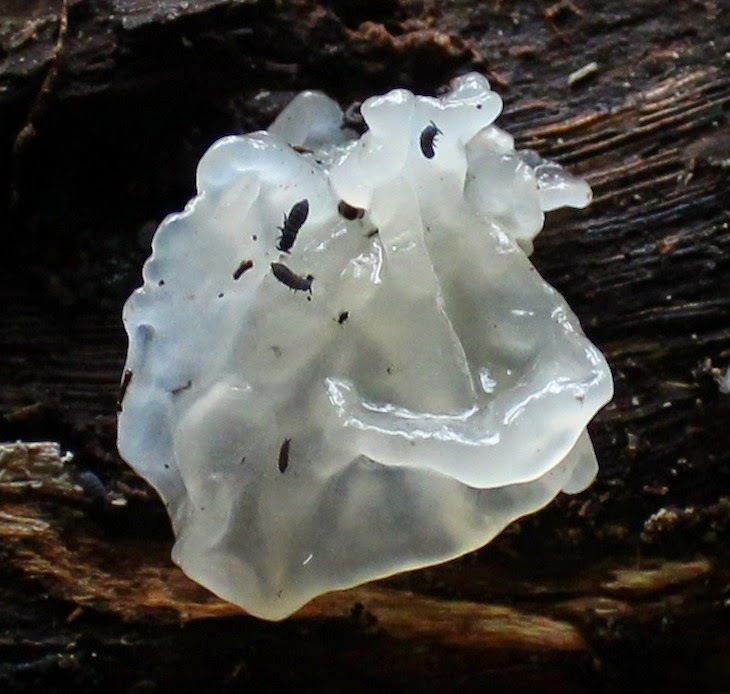 These jelly fungi are reminiscent of a galaxy of stars - tiny worlds on a log. When looking closely at a fungus, you will often see small animals scuttling around its surface. Some tiny insects called springtails spend their whole life cycle within the gills on the underside of a mushroom! Planet earth may be the "world" as humans know it, but for many species their world is much smaller. Also, some fungi cluster in ways that are reminiscent of galaxies or complex networks. You will often see the intricate dendritic pattern of mycelial threads at the base of a fungus, reaching down into the soil. 3. In intact nature, all living creatures are connected, but most connections are invisible. Here you can see mycelial threads that connect this mushroom with the earth - what other connections do you see? 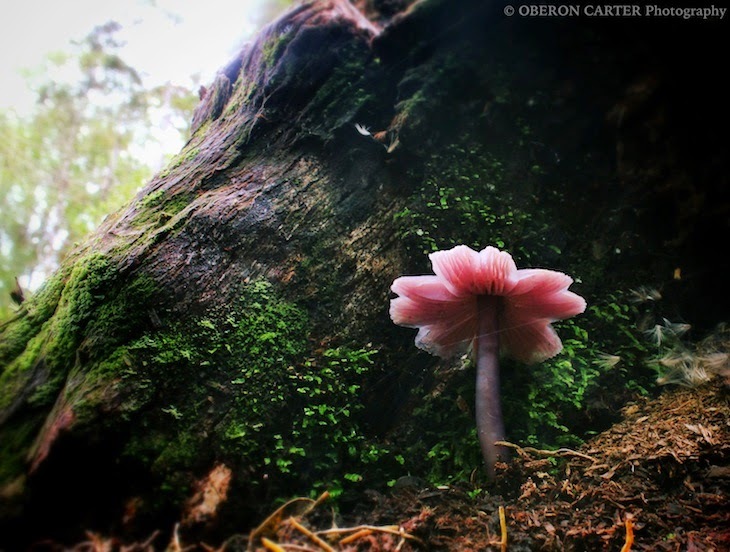 The pretty little mushrooms and other fungi that we see are not the whole organism, rather they might be considered as the fruit, whilst much of the species grows beneath the surface (of the wood or soil substrate). Those underground parts (called mycelium) often form associations with the roots of plants and these can extend throughout a forest. I think there is a lot still to learn about this phenomenon and the invisible ways that a forest communicates with itself and its environment. Translating this to humans, whilst we can be physically connected, we are more often connected with others in invisible ways such as through our hearts or our shared thoughts and visions. Whilst I am not religious, I do feel my spiritual connection with nature is broadening over time. I feel like more of the connections in my life become visible or perceivable through observation of fungi. I feel less like my garden at home is completely disconnected from my favourite areas of native forest far away, and that these areas are connected through earth and water and fungal mycelium! Such thoughts only strengthen my affinity with natural areas. 4. Science and art can be strong partners. 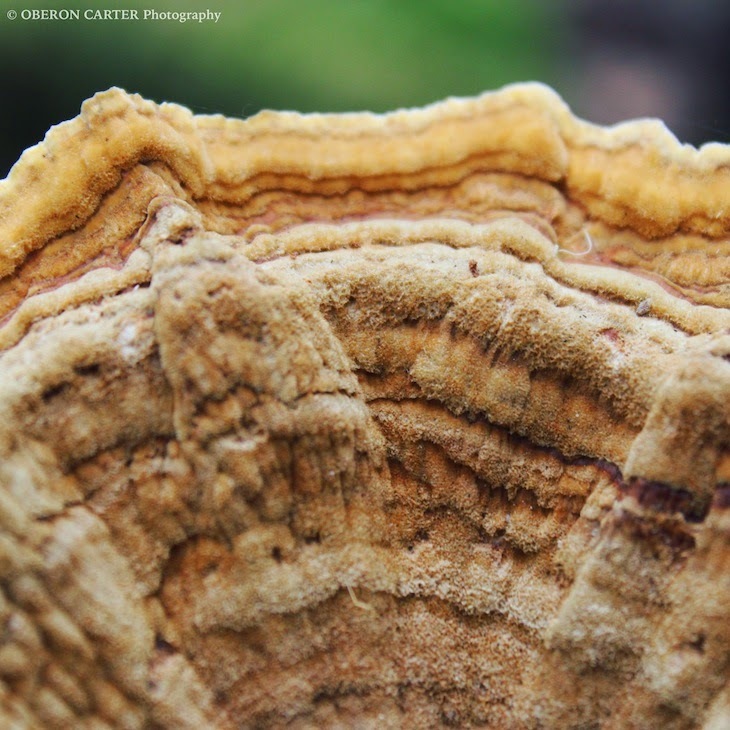 Zoom in close enough to a fungus and the colours and textures invoke an art piece as much as a scientific depiction! Advances in digital photography and social media have provided great opportunities for fungi study. Mobile phone photography makes it easy to physically get the camera lens to point at harder-to-reach features of fungi. Increasingly I see fungi through both a scientific lens (what is its name, how does it work etc.) and an artistic one (look at the shape, the little bonsai-style setting, the patterns and texture!). I try to create images that provide enough information to identify the species, but I want them to be visually pleasing or interesting. This art part makes communicating the science part more effective, and thus I see the two disciplines as strong allies! 5. There is a stigma attached to fungi and related processes of death and decay and these inhibit human empathy towards nature. Decaying fruiting body of Mycena cystidiosa, standing tall to the end. In online discussions I've read many comments by others about how "gross" fungi and slime moulds are. I wonder if such disgust stems from a deeply-set avoidance instinct developed as a personal safety mechanism? I have a fear of big hairy spiders and I've seen other people carry massive tarantulas on their hands - this repulses me, but I'm sure my feelings stem from ignorance about those spiders as much as anything. Slimy or decaying fungi are not to be feared! Just wash your hands afterwards and all will be well! 6. Beauty can come from darkness. Porpolomopsis lewelliniae, emerged from the darkness. 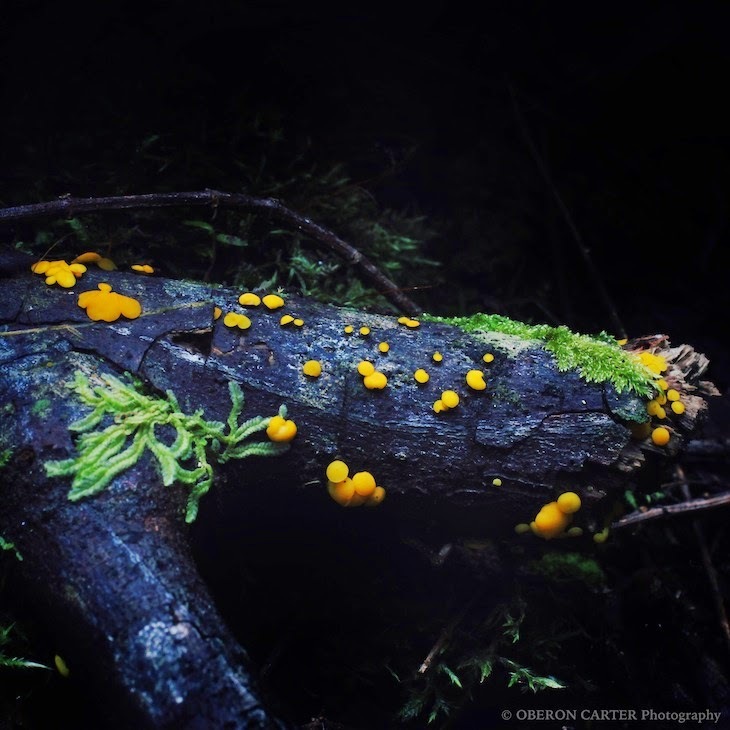 Many fungi grow in darkness; hundreds of microscopic fungi may reside in the woods of a single fallen log. Many larger mushrooms fruit on the dark underside of logs and branches, in deep dark leaf litter and in hollow logs. 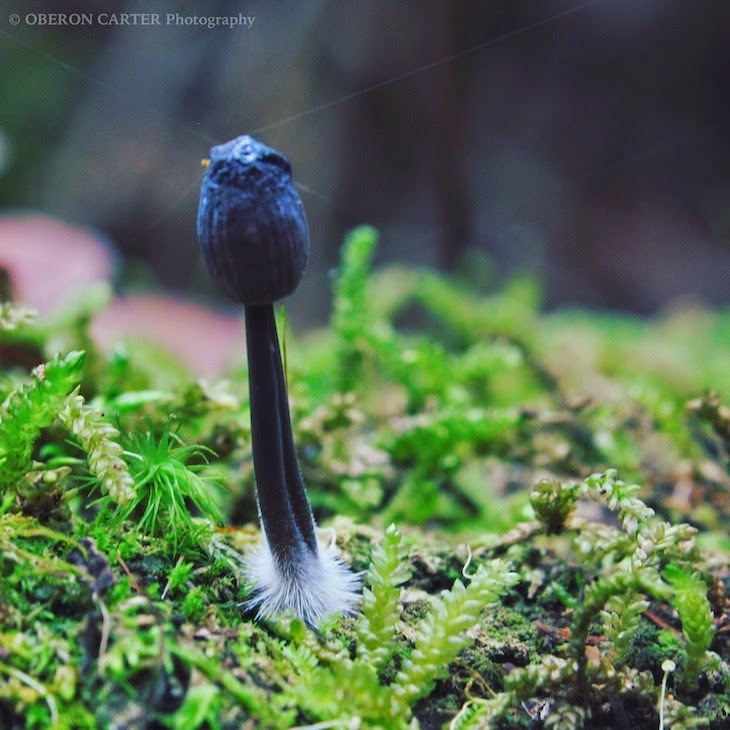 Despite the darkness of these places, many fungi thrive. 7. Even the very small can hold their head high. 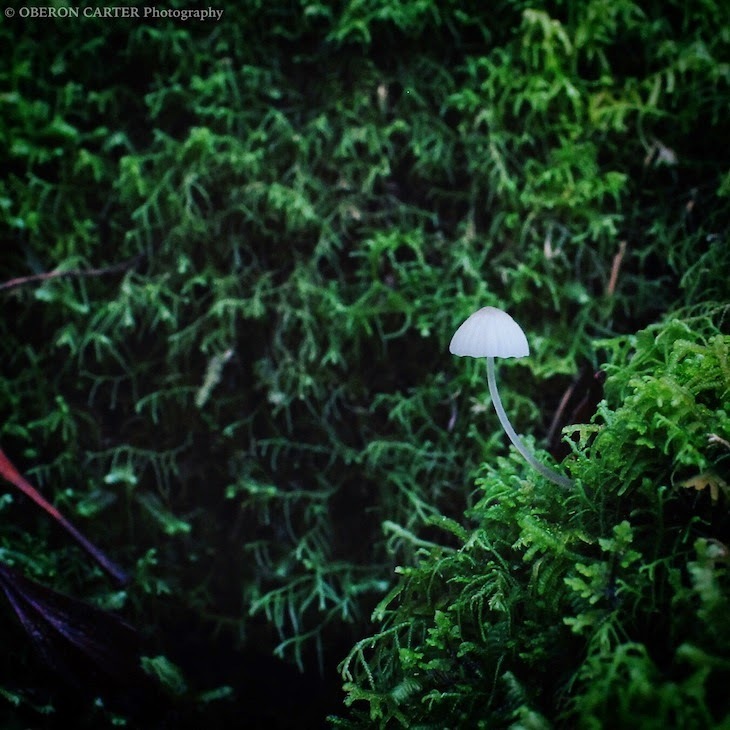 Even amongst forest giants, this delicate mushroom holds its own. In Tasmania we have trees that are nearly 100 metres tall making them the tall flowering plants in the world. Around the base of these trees, if you look closely, you're likely to find tiny mushrooms, maybe just a few centimetres tall. But here the height difference doesn't matter - every being holds their own space. Every individual is distinct but integrating as an effective community. 8. We all have opportunity to reinvent ourselves by the choices we make each day. Be your own earth star! When you see a mushroom and it has sagged into a decaying, goopy mess, the organism is still very much alive below ground. It might pop back up fresh nearby soon after, or it might wait until condition are suitable in future years. Translate this to humans and we can wake up each day a sagging goopy mess, bearing the burdens of yesterday, or we can wake up fresh and be whoever we choose to be! 9. Nature is much more than skin deep. A family of springtails doing their thang on the jelly fungus, Tremella fuciformis. One thing that I think really draws me into spending time in nature, is that it is not superficial. I think understanding of the more subtle or complex aspects of nature (e.g. All the small creatures and their interactions) increases with time spent immersed in it. The cool thing about fungi is that you're going to see different species and stages of fungi growth with each visit to an area. 10. Learning is never complete. 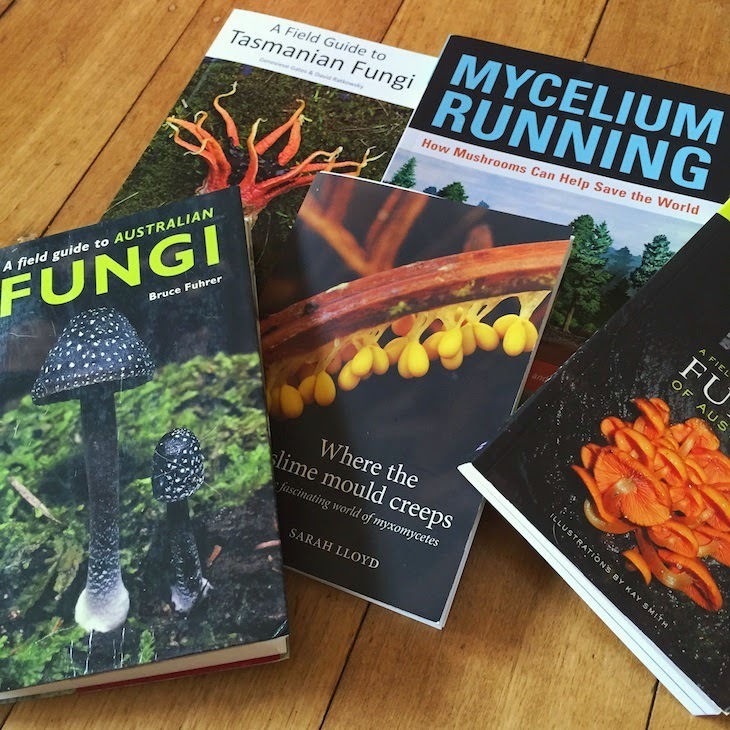 The great thing about fungi books is that they are almost always pretty to look at! When I started learning names for fungi, I had aspirations to learn ALL the names! To learn ALL the things! But the reality is that our time to learn new things or follow any pursuit, is limited. So, I've come to realise that simple idea that "you can only do what you can do"! For example, I have dozens of books-to-read on my shelves, probably enough to last the next few decades - so many classic and amazing books I'll probably never get to read given a busy life - this is kinda sad, but it just encourages me to prioritise! Likewise with fungi, or any other activity really, I think it is important to focus on doing more of the stuff you really love. Learn for the sake of learning and share your knowledge with others and happiness will inevitably follow! As you can see, these hitherto unseen organisms have had a profound effect on me - and it's only the been one year! 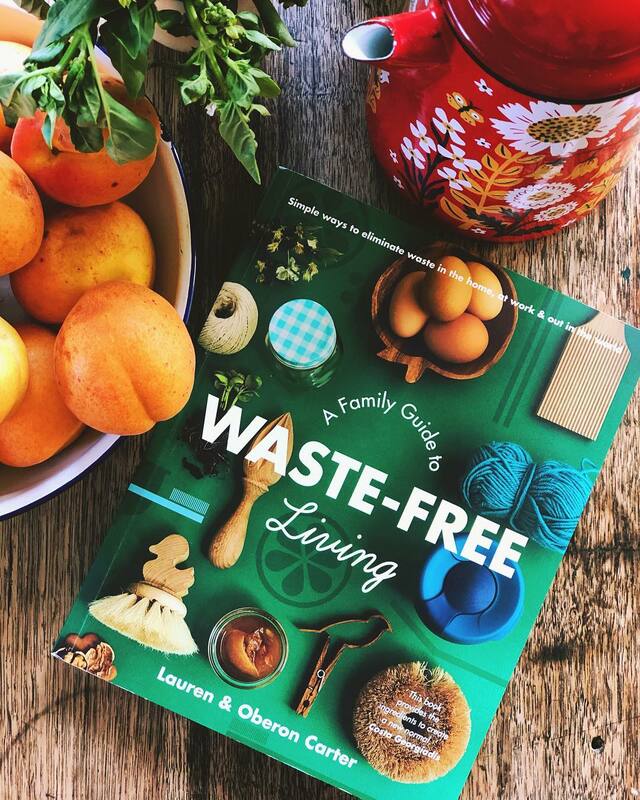 Have you had an equivalent hobby influence your world view? You can see more of my fungi photos on instagram @owletpapa. You can find a link in the sidebar. Great post. I've never seen or heard of some of this fungi. Also love the lessons you've shared with us after each photo. Thanks for reading, Darcel! Yes, there are so many wondrous little creatures living out there, its just that many of them are tiny and well camouflaged! Thought provoking article. Thank you. Thanks for reading it - glad it resonated. Cheers, Oberon. I used your blog in my blogging class at school today. Also the florentine!!! Was going up there now? Cheers!! Great blog and great article!